KANSAS CITY, Mo., May 23 (Reuters) – Germany’s Bayer AG (BAYG.DE: Quote, Profile, Research) is battling to keep thousands of U.S. rice farmers from becoming part of a massive class-action lawsuit over the contamination of commercial rice supplies by a Bayer biotech rice not approved for human consumption. In hearings this week in federal court in St. Louis, Missouri, lawyers representing rice farmers said about 7,000 long-grain producers in Missouri, Arkansas, Louisiana, Mississippi and Texas should be allowed to seek unspecified damages against Bayer for contamination that was uncovered in August 2006. Farmers suffered extensive losses, both from a plunge in rice prices, and in a drop in export business as Japan and the European Union moved to restrict U.S. rice from crossing their borders. Many farmers also were not able to plant a crop the following year because of seed shortages tied to the contamination, and had to undertake costly clean-up efforts, according to plaintiffs’ attorneys. Bayer is fighting the class-action move, and both sides are now awaiting a ruling from U.S. District Judge Catherine D. Perry . VIENNA, Austria – A sharp rise in food prices has developed into a global crisis, U.N. Secretary-General Ban Ki-moon said Friday. 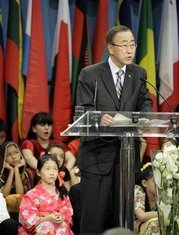 Ban said the U.N and all members of the international community were very concerned and immediate action was needed. He spoke to reporters at U.N. offices in Austria, where he was meeting with the nation’s top leaders for talks on how the United Nations and European Union can forge closer ties. “This steeply rising price of food — it has developed into a real global crisis,” Ban said, adding that the World Food Program has made an urgent appeal for additional $755 million. Ban urged leaders of the international community to sit down together on an “urgent basis” to discuss how to improve economic distribution systems and promote the production of agricultural products. An estimated 40 percent increase in food prices since last year has sparked violent protests in the Caribbean, Africa and South Asia. On Thursday, U.N. Food and Agricultural Organization chief Jacques Diouf said immediate efforts should focus on helping farmers in developing countries grow more crops. Josette Sheeran, the World Food Program’s executive director, has likened the price increases to a “silent tsunami,” and said requests for food aid are coming in from countries unable to cope with the rising prices. She noted that the price of rice has more than doubled since March. The World Bank estimates that food prices have increased by 83 percent in three years. 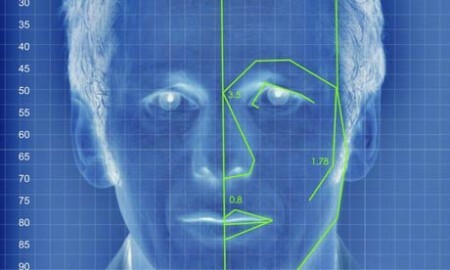 Officials say automatic screening more accurate than checks by humans. Jean-Claude Juncker, the EU’s ‘Mr Euro’, has given the clearest warning to date that the world authorities may take action to halt the collapse of the dollar and undercut commodity speculation by hedge funds. Momentum traders have blithely ignored last week’s accord by the G7 powers, which described “sharp fluctuations in major currencies” as a threat to economic and financial stability. The euro has surged to fresh records this week, touching $1.5982 against the dollar and £0.8098 against sterling yesterday. “I don’t have the impression that financial markets and other actors have correctly and entirely understood the message of the G7 meeting,” he said. Mr Juncker, who doubles as Luxembourg premier and chair of eurozone financiers, told the Luxembourg press that he had been invited to the White House last week just before the G7 at the urgent request of President George Bush. The two leaders discussed the dangers of rising “protectionism” in Europe. 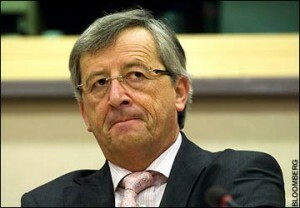 Mr Juncker warned that matters could get out of hand unless America took steps to halt the slide in the dollar. BRUSSELS: President Nicolas Sarkozy of France and Chancellor Angela Merkel of Germany will end months of wrangling Thursday by presenting a joint plan to strengthen Europe’s ties with countries on its southern borders. BRUSSELS (Reuters) – European Union leaders were set to give formal blessing on Friday to a French proposal for a Mediterranean Union to boost ties with the bloc’s southern neighbours, a draft final statement showed.